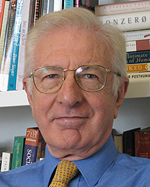 Professor Lord Richard Layard directs the Wellbeing Programme at the ESRC Centre for Economic Performance, and has made major contributions on unemployment, inflation, inequality and post-Communist reform. Author of the influential book Happiness, he currently works on how to produce a happier society and advises the UK government on mental health policy. I never meant to. I was teaching in a comprehensive school and going to evening classes at the London School of Economics (LSE). Through the LSE connection I was asked to be the research officer for the Robbins Committee (Committee on Higher Education, 1961), and after that I was offered a research job at LSE. What career achievements are you most proud of? Five. First, the Robbins Committee’s research. Second, in the 1980s I developed with colleagues the so-called Layard-Nickell model of unemployment which showed there was an equilibrium level of unemployment below which inflation accelerated. We demonstrated how welfare-to-work policies could reduce this level of unemployment, and this was used to support welfare-to-work policies all over Europe, especially in Scandinavia, Germany and Britain. Third, in 2005, I published Happiness – arguing that this should be re-established as the goal of public policy. This seems to have struck a chord worldwide. Fourth, since then I have helped to build within the NHS the world’s first evidence-based and quality-controlled service of psychological therapy for depression and anxiety disorders. It probably required the combination of a psychologist (David M Clark) and an economist to get the necessary government support. Finally, I have helped found a number of organisations, including the Centre for Economic Performance at LSE, the Employment Institute, and Action for Happiness – all of which have succeeded through the wonderful efforts of others than myself. What is the most important issue society is facing today? Global warming threatens the way of life of most people in the world – everyone near the sea, near many rivers, and near most arid areas. The solution is cheap clean energy, but only two per cent of the world’s publicly financed R&D goes on trying to produce this. That is why a group of us have proposed a Global Apollo Programme – an internationally co-ordinated research programme of at least double the present scale. What do you feel is the most important finding of economics and social science over the past 50 years? That happiness can be measured. Therefore its causes can be uncovered and both individuals and policymakers can make it their aim to create as much happiness as possible in the world and as little misery. Quantifying the direct and indirect determinants of happiness should be one of the main objectives of social science. Outlook at 50: As part of marking ESRC’s 50th anniversary we have asked a selection of leading ESRC-funded researchers to share impressions from their own careers and thoughts on the role of social science in society.